Home ♦ Coffee ♦ Coffee Freebies for National Coffee Day, Sept 29th! Coffee Freebies for National Coffee Day, Sept 29th! Sunday, September 29, 2013 is National Coffee Day. A good way to celebrate is with a cup of coffee – but an even better way to celebrate is with a free cup of coffee (and maybe a pastry to go with it!). Starbucks: Free coffee tastings of the new Ethiopia coffee blend at Starbucks – and anyone who purchases a one-pound bag of Ethiopia beans in-stores that day will receive a free Ethiopian-inspired ceramic cup (while supplies last – go early). Peet’s Coffee & Tea: Order any baked item or oatmeal between 10 am and 2pm on National coffee day and get a free small maple latte, their seasonal offering. You’ll need to bring this coupon with you, though. Caribou Coffee: Free small coffee of the day at participating stores with a coupon, printed or shown on your mobile device, from their Facebook page. Tim Hortons: Say “Happy National Coffee Day” when you order your coffee and you’ll get a buy one, get one free deal on your coffee order. 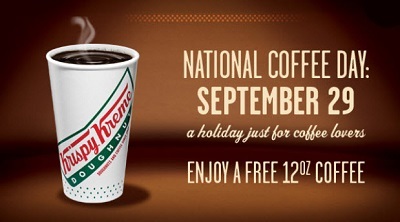 Krispy Kreme: Free 12-ounce cup of hot coffee and $1 small specialty drinks, like the Pumpkin Spice Latte.